Mason Ashley Photos, News, and Videos | Just Jared Jr.
Wesley Stromberg Drops 'Back to You' Cover With Mason Ashley - Watch Now! 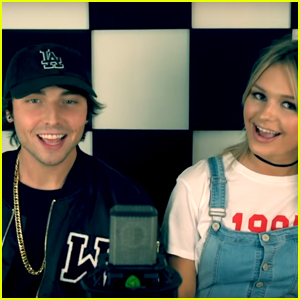 Wesley Stromberg just released a cover of “Back to You” and you need to hear it! The 23-year-old singer teamed up with friend Mason Ashley for the recording, which was originally sung by Bebe Rexha and Louis Tomlinson. This isn’t the first time Welsey and Mason have teamed up though! They also recorded a cover of Post Malone‘s “Congratulations” earlier this year. Make sure to check out the new music vid! Watch her music video below! 1. I have a dog named Koko and she’s the cutest thing in the world…but she has no personal space and will literally climb on my face. 2. I am currently in cosmetology school learning how to do hair and get my cosmetology license. 3. I was homeschooled most of my school years because we used to travel a lot when I was younger. 4. I am absolutely TERRIFIED of bats. 5. I actually really enjoy listening to rap music and I feel very accomplished when I memorize verses. 6. I love dancing and grew up doing musical theater. 7. The only sport I’m good at is snow skiing…even though I live in Texas. 8. I’ve watched The Office all the way through at least 6 times. 9. Anytime I travel, I look for the best local coffee shops…I’m a coffee addict. 10. I’m allergic to peanuts, and peanut butter is one of my favorite things in the world so as you can imagine…that’s kinda depressing.